Calling all WVU Mountaineer fans! 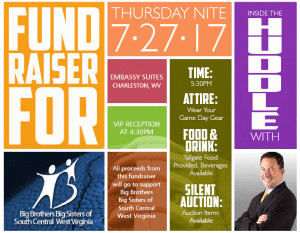 It is time for the 10th Annual Inside the Huddle with Tony Caridi to benefit Big Brothers Big Sisters of South Central West Virginia. The event is scheduled for July 27, 2017 beginning at 5:30 p.m. at the Embassy Suites in Charleston, WV.